VPN Servers are great to get basic privacy. But many people misunderstand that they only shift their trust from their ISP and local network to a VPN provider. Every VPN provider out there promises you that they will not keep logs. Next thing you know is that they are giving out logs to any f*ucking three letter agency. Nah, you have to set up your VPN Server yourself to keep the keys to the kingdom - your communication. This little app helps you do exactly that with a bunch of clicks. Before we can help you to easily spin up your own VPN Servers on Vultr, we need your API key. Please sign up at Vultr and browse to the API Settings Page and copy your key to our app. After the initial setup you are prompted with the list of locations. Choose one. The app creates an Ubuntu server for you (Vultr's smallest plan). Once it is online, we will generate SSH Keys and install OpenVPN for you. This will take some minutes. Now you will see all the VPN servers you have created. Beside the City and the Country, you can see the assigned IP. The amount of money you will have to pay for the Server instance can be seen right next to it. With the controls you can Pause and Start an VPN connection. 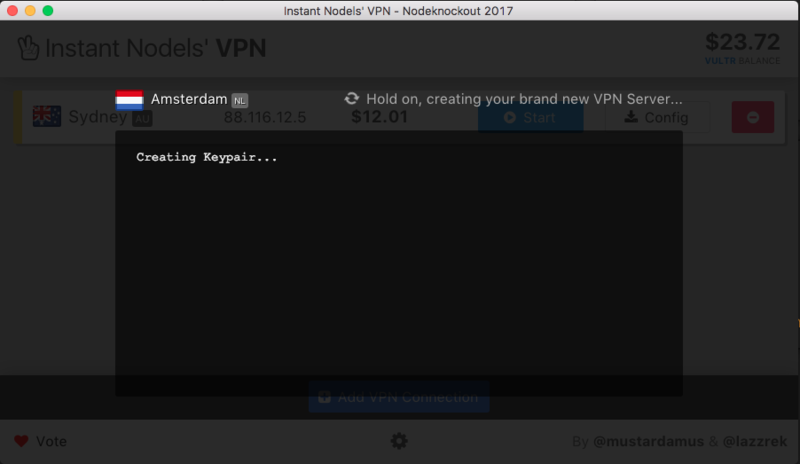 Click on the Config Download Button to get your OpenVPN config file. 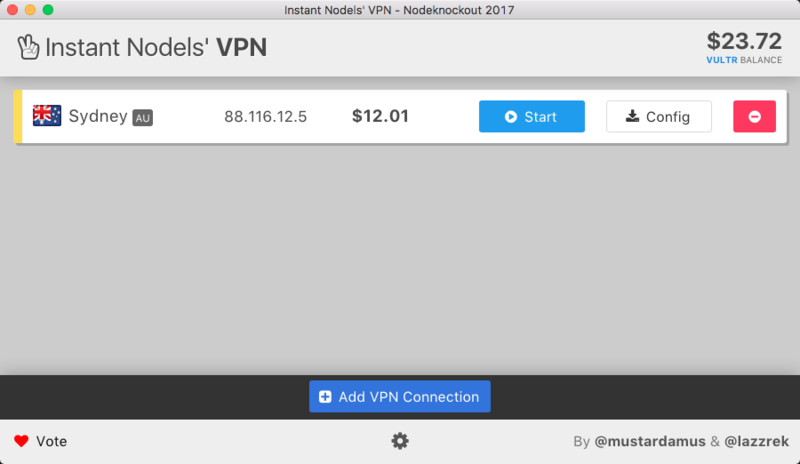 You can open this config with OpenVPN or 3rd party apps on any system. Next to it you have the delete button which will stop the connection and destroy the Server. On the top right of the app you can see your balance in your Vultr account. Due to unforeseen party obligations and excessive consumption of various liquids we basically have given away precious hours that we needed to wrap it up. Anyway, as always it has been a fun ride and we will be next year, maybe a little bit wiser. A warm welcoming settings page where you can set your Vultr API Key. A pretty dope list where you can choose a Server Location. Generating SSH Keys for an Server, and communication over a secure line. See the output of the OpenVPN installation process. Having a full blown VPN Server under your control, bummer that we can't help you connecting to it. But you can get the config yourself and connect to it with OpenVPN or Tunnelblick.